When we parent with the heart in mind, we have to consciously keep kindness front and centre. Warm, connected relationships with our children rely on kind actions, words and even thoughts. If we are to be a kind parent, we also need to be a kind person, and so our warmth and grace are not limited to just our children. Ideally kindness is our go-to, regardless of the recipient. Yet, there is one person who often misses out. Our words toward them are less gentle, and we have far less grace for their mistakes. We criticise them for faults we overlook in others. We hold them to unreasonably high expectations. Who is this poor soul? Take a look in the mirror and you'll see. No matter how kind we are to others, chances are we don't extend that to ourselves. We are so often our own worst critic. Whether it is physical appearance, the ability to get through a to-do-list, or behave in the 'right' way in new situations, we usually expect so much more from ourselves than we would from anyone else. We don't begrudge a friend forgetting something when they are busy, but we 'beat ourselves up' for days when we overlook something. We admire the strength in a Mum who is juggling work and family, noticing all the positives in her, and yet all we point out in ourselves is the gaps, the holes, and the failed juggle. We notice the warm smile of a friend rather than what she's wearing, and then apologise to her about the state of our outfit and hair. We need to call time on our self judgement and throw a cup of kindness in our own direction. We are as worthy of understanding and gentleness as others. Just like the other people in our lives, we're doing our best. We'll make mistakes, stumble, and come up short, and that is OK.
Our parenting will never be perfect, and our children will still be alright. When we look at ourselves with kindness we can put more focus on what we do well, or what we are trying to achieve overall instead of just finding the holes. 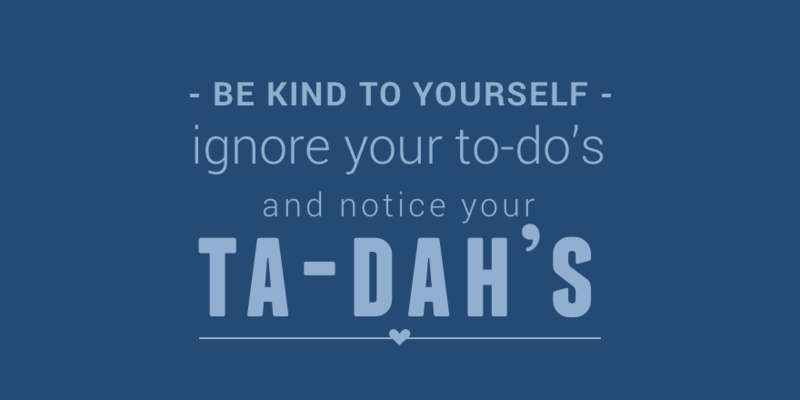 We can ignore our 'to-do's', and notice our 'ta-dah's'. We need to ask the same question we would when dealing with anyone else - "how would kindness respond"?